We’re putting on a panel! Set your calendar for Thursday, June 27, when Streetsblog will moderate a discussion, “Whose Streets? Reclaiming New York City for Cyclists,” as part of the Museum of the City of New York’s ongoing “Cycling in the City” exhibition. Just as the museum show spotlighted more than a century of conflict between cyclists and car drivers, the panel will focus on the ongoing battle for New York’s byways. Streetsblog Editor Gersh Kuntzman will oversee the discussion with panelists including Council Member Antonio Reynoso of Bushwick; Helen Ho, co-founder of the Biking Public Project; and Judi Desire of Uptown & Boogie Bicycle Advocacy. Kuntzman told Streetsblog that he guarantees a spirited discussion. “This city is at a crossroads,” Kuntzman said. “Vision Zero has made initial strides for safety, and congestion pricing offers a huge opportunity for the city to rethink the way it uses its roadways, but city officials still seem to view people who chose to get around by bike as effete hobbyists or criminals, while drivers continue to see cyclists as congestion-causing pests who ruin neighborhoods with their bike lanes and demands to remove parking. 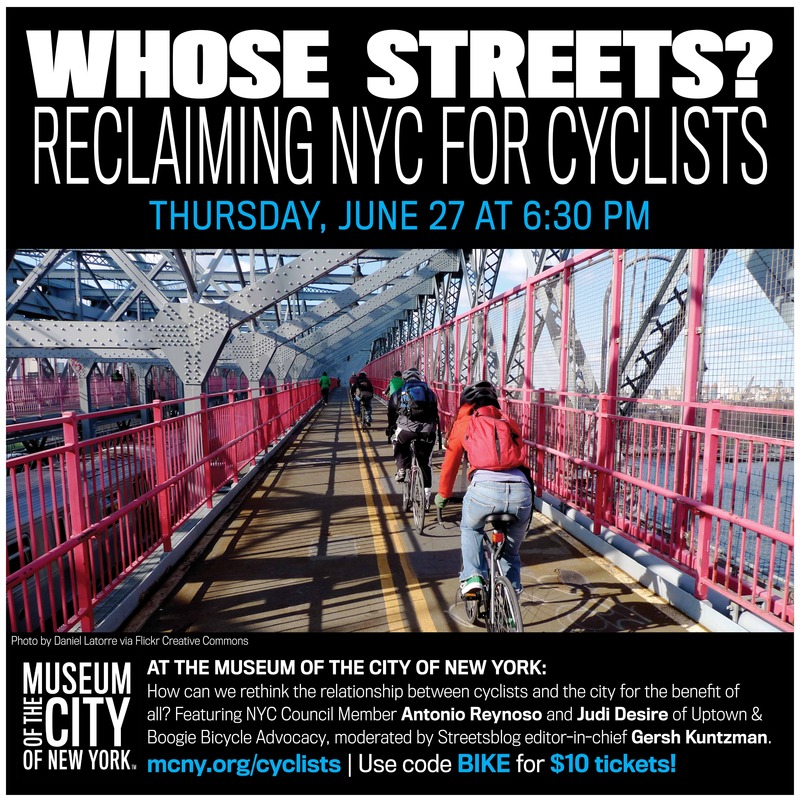 “Whose Streets: Reclaiming NYC for Cyclists,” June 27, 6:30 p.m. at the Museum of the City of New York (1220 Fifth Ave. between E. 103rd and E. 104th sts. in Manhattan). For information, call (212) 534-1672. To qualify for $10 tickets to the event, go to the ticket site and use the discount code “BIKE” (you’re welcome). The full information, including updates on surprise panelists, is here. It's also one of the biggest missed opportunities in town. The driver will likely say he didn't know he struck the cyclist — a sure-fire way out of a "leaving the scene of an accident" felony.